This story was updated Feb. 20, 2018, at 11:59 p.m. with more information. 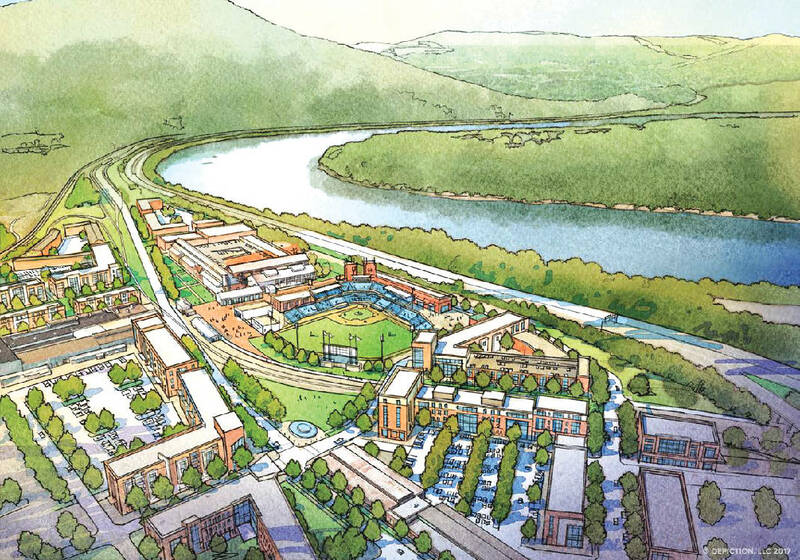 The Chattanooga Design Studio, using the ideas voiced by 250 people who attended a series of public meetings last fall, suggests building a new baseball stadium for the Chattanooga Lookouts, a new track and sports facility at Howard High School and new types of housing and parks will bring more residents, businesses and visitors south of the freeway. The 128-page report said the Southside should capitalize on plans for a new Interstate 24 exit, the extended Tennessee Riverwalk and the availability of 140 acres on the former site of the Wheland and U.S. Pipe foundries for new retail, housing and stadium development. This aerial view of the South Broad District shows the large Wheland/U.S. Pipe site in the foreground and is looking east toward The Howard School.